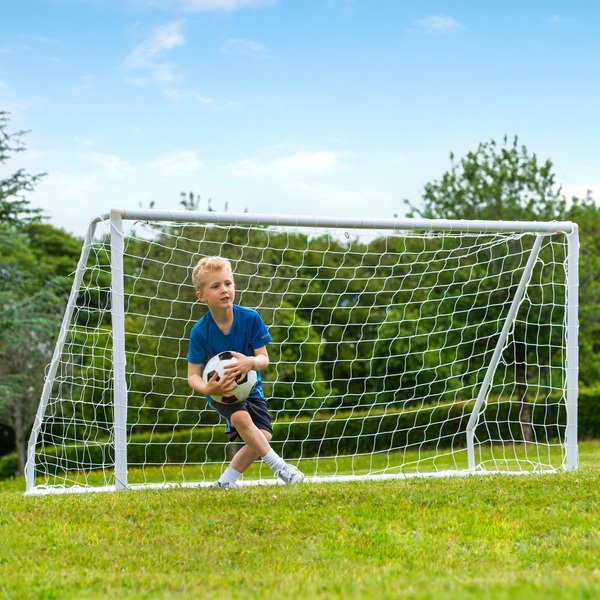 The 8 x 4ft Striker Goal is perfect for your little footballer. This professional style football goal is ready for every match and kick about. This 8 x 4ft Striker Goal features a polyester meshed net in white. The Striker Goal is fully portable and easy to store, making it simple to choose and change your playing field. This allows you to easily transform your garden from lawn to pitch and back again. The 8 x 4ft Striker Goal will get the kids outside to play, where they can develop their competitiveness and teamwork while staying active and social. The posts are freestanding and require no other support. The Striker Goal boasts high levels of flexibility and durability to provide you and your kids with more and better outdoor play. This professional style football goal is suitable for use in your back garden and can be used on any surface. It comes complete with 20 fixing clips and 6 ground pegs, ideal for anchoring it to lawns or other grassy areas. The 8 x4ft Striker Goal is eay to assemble and requires no tools to complete the assembly process.